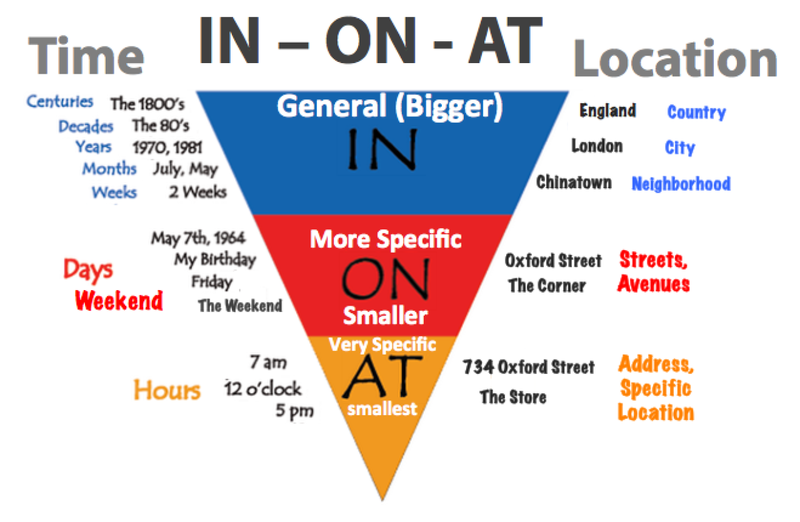 Please share some simple rules of using prepositions IN - ON - AT. For prepositions of time, I created a video that shows the usage of in, on, and at. Hope this helps! PS: for time we can use "on" & "in"
b- At time: At the moment (no delay). Wow!! This is really helpful. I had never thought of such a great way to put this. I am an ESL teacher and I will definietly use this resource in class. Well, this rule is great and really help.
" I'm interested in buying your car..."
" My hobby is spent some time on the internet..."
prepositions are the hell of English language and I had problems with them as well. I would recommend you "English Grammar in Use " by Raymond Murphy . Every grammatical topic is perfectly described and explained there. Of course it's not a bad idea to learn the whole phrases by heart and then just use the pattern, But believe me if there is problem just with prepositions you will be understood anyway. And once you get used to them it will come out of your mouth naturally . Please, someone explain to me about the use of (in, at, on) and (for) and (to)? Prepositions in expression of time: in, at, on, ago.